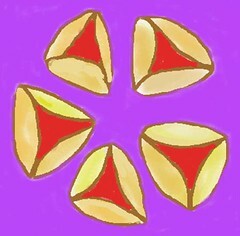 Yesterday I posted my little digital drawing of hamentashen for Purim, created with Painter's digital pastel. 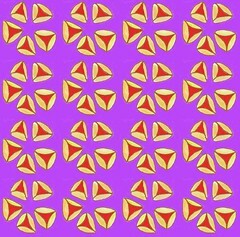 I also used Painter to "capture" the image as a pattern, and then used the pattern to make the image I am posting here tonight, of many happy hamentashen, which are filled cookies for the the holiday. The dough is cut in circles, and then the edges are folded over to make a triangle. These are just digital cookies, but I would say that the filling is cherry. . . . It's Purim, and time for Hamentashen! I love to eat these little triangular cookies, but it also makes me happy to look at them! This is a digital sketch that I created tonight with my Painter program, using digital pastel. I will use this little image to send greetings to friends and family. While I was at it, I created a pattern from this image, and I plan to post it here tomorrow. Today I worked on this collage and decoupage project for a while, a heart-shaped box that I am covering with bits of printed metallic ribbon. This photo shows the inside of the top of the box, which is the part I have been working on for the past few days. I didn't get to work quite as long as I wanted to, but I did make progress. As I close up more of the gaps (where the orange cardboard shows through), it is becoming easier to how this part is going to look when it is finished. Today I continued to work on this project, a heart-shaped box that I am covering with collage and decoupage created from printed metallic ribbon. 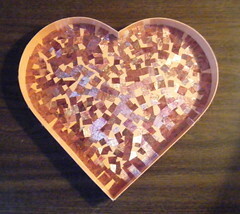 I am still working on the inside of the lid of the box, shown here. Although it seems like I am close to finishing that area, there are still quite a few gaps that I need to fill with ribbon. 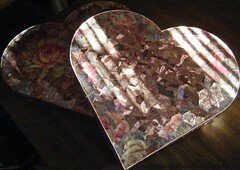 I worked on this project today, the heart-shaped box that I am covering with decoupage and collage made from printed metallic ribbons. I worked on the inside of the top of the box, shown here. I made some progress today, although the work is slow. It was rainy all day, and so dark and gloomy that I worked on this (and photographed it) under electric light, which gives the ribbon a nice soft glow. 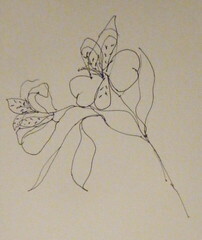 This is a pen and ink sketch of freesia. Today I came across this little drawing when I was going through some notebooks in my studio. I did this sketch a few years ago as a demo in a little drawing class that I was teaching. Although I can see some things in this sketch that I might want to change, I do like it just as it is. So tonight I took a picture of the sketch, transferred it into the computer, and cropped it to get this composition. Now if I want to, I can do something more with this sketch, but even if I just leave it alone, it is good to have the image in the computer. 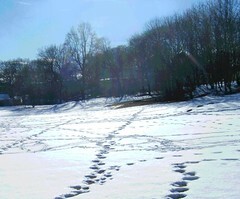 I used Painter software to create this posterized version of the photo that I posted here yesterday: tracks left by footprints on a snowy playing field in a local park. This is another image from photos taken during Friday's walk through a neighborhood park. 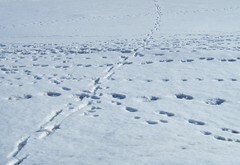 I liked the patterns made by footprints in the snow, and this view was cropped to concentrate only on the linear tracks in the snow. I also created a posterized version of this image, which I plan to post here tomorrow. This is a posterized photograph, a digitally modified version of the image I posted yesterday. I used Painter to apply some digital pastel to even out the sky. 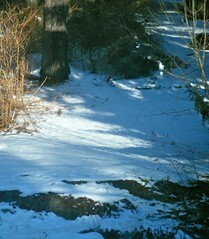 Then I posterized the photo, which resulted in some interesting color variation in the snow and in the trees. I have been stuck inside with a bad cold, so today was my first walk in a week. The destination was a small neighborhood park. 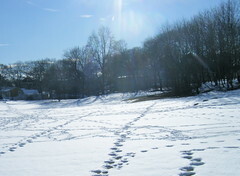 Although the park was empty, the many footprints show that it is well-used for fun in the snow. The dog also seemed to think that it was a great place to run around, if only for a few minutes. I liked the patterns of the tracks in the snow, so I took some pictures. This is one of the original photos, edited just a bit. I also created a posterized version of this scene, which I will post here tomorrow. This morning, I caught myself looking out the window and admiring the play of morning sunlight and shadow. I took a picture, and tonight I used iPhoto to adjust the exposure a bit and then to crop the image. Once I had the photo uploaded to Flickr, I decided to crop a bit more. I edited the photo on line (using Flickr's Picnicker). Then I went back to the photo on my computer and duplicated the second crop in iPhoto. 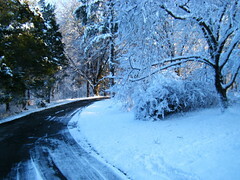 It snowed yesterday and this morning the tree branches were covered with snow. I took a few pictures through the window because I liked the effect of the branches backlit by the morning sun and the tracery in the background. (Most people don't think of snow as linear, but snow places a lot of visual emphasis on line.) Tonight I cropped this image out of the original photo, then used Painter to adjust the exposure because the next step was to posterize the image, which often makes things darker. 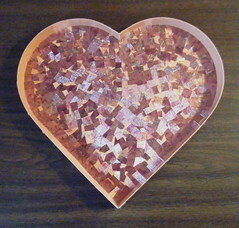 This is a collage and decoupage project in progress, a heart-shaped box that I am covering with pieces of printed metallic ribbon. The outside of the box is basically finished, so now I am working on the interior surfaces. 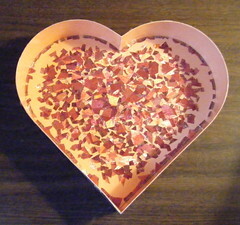 Yesterday I posted a photo of the interior "floor" of the box, which will be red. The photo I am posting here tonight is the inside of the top of the box. I am using just one pattern, but it contains many colors: orange, purple, fuscia, silver. But seen from a distance, it looks pink. 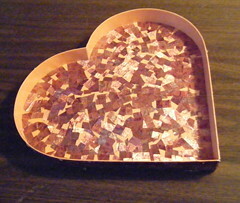 Here is the latest on the heart-shaped box that I am covering with collage and decoupage designs. I have been working on this over the past week, mainly concentrating on the interior of the box, which is going to be variations of the brightest reds I can find. This is how it looked as of February 13. I also have been working on the inside of the box top, and I plan to post that here tomorrow. 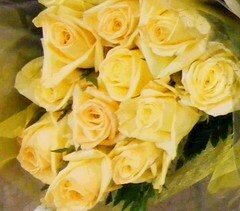 This is a posterized photograph, one last crop from my photo of the display of roses at "Trader Joe's" grocery. I used Painter to posterized the image. I think this composition is the best one Valentine's Day. I have gotten a lot of mileage out of these grocery store roses, but I think you can find beauty anywhere, if you just look. . . . 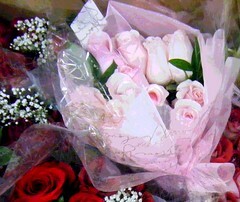 This is another view of the bunches of roses on display at Trader Joe's grocery. I cropped the original photograph to get this image. In this case, I zoomed out to include bouquets in various colors. I used Painter to apply a soft color overlay and to posterize the image. 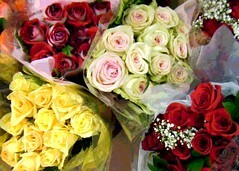 This is another image cropped from photos that I took this week at Trader Joe's grocery, where roses were on display for Valentine's day. I used my Painter program to posterize this image. 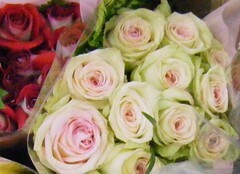 Earlier in the week during a stop at Trader Joe's grocery store, I was admiring roses on display for Valentine's Day. So I took a few pictures. Last night, I cropped this image out of the original photo. Then I used Painter to add a color overlay and to posterize the image. Today I made one more crop to get this image from some photos I took back on January 29th. 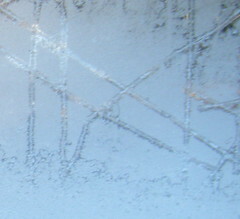 The ice on the window created some found art. I just cropped the natural abstractions to create a pleasing composition. 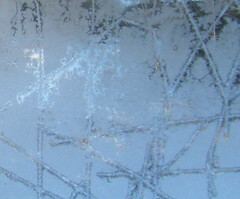 Yesterday I posted a piece of "found art," a photograph of ice on the window, taken on January 29, a particularly cold morning. 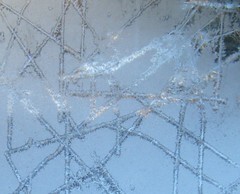 This image is another photograph of ice on the window: same window, same ice, different crop. We had some very cold weather in late January, and in the morning, there would be frost on the windows. 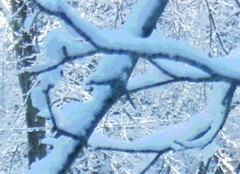 Tonight I cropped this image from a photo that I took on the morning of January 29th. I liked the translucent patterns made by the frost and the sunlight. 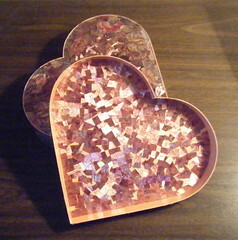 Today I finally got back to this heart-shaped box that I am covering with collage and decoupage designs created from printed metallic ribbons. This afternoon, I filled in the last of the gaps on the underside of the box. This has a brown center and a floral border, and because the center is relatively plain, I think it might make a useful image for February 14. In any case, there is more to be done on the inside of the box, but at least the outer surfaces are now done. I took some photos when I finished today, around 3 PM, and I loved the light in this shot, with the afternoon sun coming through the blinds. But I later realized that I had cut off the very tip of the box when I took the picture. I thought about using a different photo, but kept coming back to this one. So I decided to try to salvage the situation. I opened the image in Painter, copied it, and then added pixels to the bottom, creating a "blank space". Then I used cut and paste as well as digital airbrush to recreate the tip of the box and the small strip of table-top that I needed to make the image whole again. Then I cropped the image, and it was ready to upload. But once I got it into Flickr, I decided the shadows needed to be lighter, so I used Flickr's on-line editor (Picnic) to lighten the shadows. And here it is! That's a lot of trouble I suppose, but to me, it was worth it to capture the light and shadow playing on the heart-shaped box. 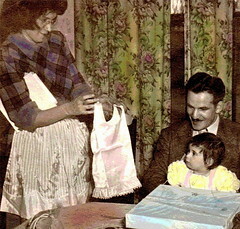 This image began with a picture from the old family album, a photograph taken at my birthday party. (The photo was taken by my uncle, Ike Fitterman, who was a professional photographer and served as a kind of family historian.) I came across the photograph the other day, and decided to see what I could do with it. I opened it in Painter and cleaned up a few scratches. Then, after a few false starts, I applied some color using digital pastel. Then I cropped the image and posterized it, and the result is a nice collaboration with my uncle. I don't look too excited about the slip my mother is showing me. But I am still very excited about the many, many gifts my parents gave me, especially the ones that don't come gift-wrapped (such as life itself). What I like best about this photo is that there I am with my mom and dad. And that is why this is a birthday present for me. 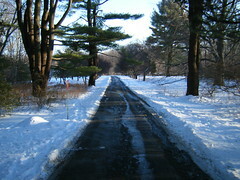 Here's another photograph from one more winter walk at Long Hill Gardens, here in Beverly, MA. Scattered throughout the gardens, which was once the Sedgwick estate, are architectural structures: columns, balustrades, pagodas, gates. I often pass by these two free-standing columns during my walks at Long Hill Gardens. But on this particular walk (late afternoon on New Year's Day), I was struck by the way the columns looked against the snow and the backdrop of the trees, so I took a picture. (The inexplicable presence of the columns lends a kind of surreal quality to the scene, like in a Magritte painting or in Last Year at Marienbad!) Tonight I cropped the original photo to get this composition. I also used the retouching tool in iPhoto to get rid of a label on one of the trees. 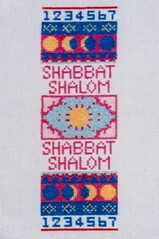 This is counted cross stitch created from my own design. Back in the 1990s, I created several cross-stitch patterns using a computer program called PC Stitch. Then I used the pattern to create this piece of embroidery. Yesterday I was looking through one of my photo albums and came across a snapshot of it. So tonight, I scanned the photo into the computer. In the photo, the piece was still in the embroidery hoop, but off-center. No matter how I cropped the image, I couldn't get a pleasing layout because of the embroidery hoop. So finally I opened the image in Painter and covered up the embroidery hoop with a little bit of cut and paste. 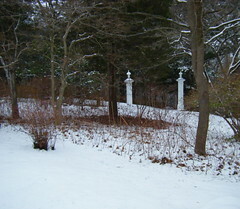 Here's a another photograph of a winter walk at Long Hill Gardens, here in Beverly, MA. I took this photo late in the afternoon on December 6. I liked the blue shadows, the glimpses of late afternoon light in the distance, the snow on the branches, and the curve of the path. I took this photograph during another late afternoon walk at Long Hill Gardens, this one on December 24th. This road cuts through a stand of fruit trees and leads out to the gate. It's a long enough walk in good weather, but when it's cold, it is a very long walk indeed. But I liked the view, so I took this picture. I tried to crop out the fence post, and it is possible to do it, but it shortens the road and changes the shapes. Besides, I like the little flash of bright orange in the afternoon light. So I left the fence post in the photo. For the past few weeks, I have been getting ready for my art show, and I have been posting my work for the show here for the past several weeks. But while I was doing all that painting, I continued to take walks, and to take photographs. So now that my art show is hung, I am catching up with recent photos. This one is from a late afternoon walk in early January. 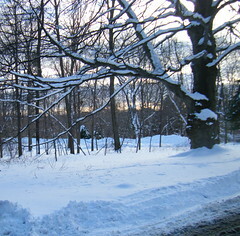 I liked the colors in the sky, and the look of the deep snow, still on the branches.